My nephew, YC, and I played doubles with my husband, C, and his brother, J, who both have Parkinson’s Disease. In their day, the brothers had killer shots. But on this summer sunny Sunday morning, it wasn’t their shots that failed, it was their legs. J was my partner. He fell several times. Even though he landed face first on the clay court, he usually returned the volley within our opponent’s white lines. “The point’s over. We won,” I said. He and C’s shots were still, many times, unreturnable. Just last summer when playing one of these tennis games with my husband, he fell and we landed in the ER. He had dislocated his pinkie. from creative commons. 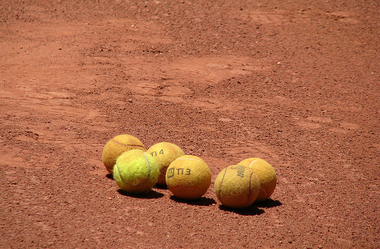 Tennis balls on a clay court. “No, I won’t,” I said. I have my limits and apparently relocating a dislocated pinkie is one of them. So I knew that tennis with a Parkinson’s partner was fraught with possible negative consequences. But this summer morning we played on. My nephew and I continued smiling, almost laughing, sympathizing with one another. We were trying to take our cue from each other. But neither of us wanted to call off the game. We all wanted to keep playing, to stay competitive, to win. Fortunately, I had to shower before Sunday chapel service. We didn’t play much longer. There were no serious injuries; although there were minor ones, like scraped knees. While the people with Parkinson’s may believe they’re “fine, fine, keep playing,” those around them may wonder if that is true or wise. If you ever do play mixed doubles with two brothers who have Parkinson’s Disease, I advice you to smile a lot. Even laugh. Because life is ridiculous. And everyone wants to keep playing for as long as possible. Beautiful! I hope I remember this bit of wisdom if/when I need it! I hope you never need it! How lucky C is to have you, full of smiles, furrowed brows and wisdom. Cheers to your family. Thanks Suzanne, but sometimes I wonder. I am not the most patient, medically interested, or sympathetic person in the world. My family of origin had a code of ethics that we never got sick. If any of my siblings ever got sick, we thought they were faking it. Sad but true.